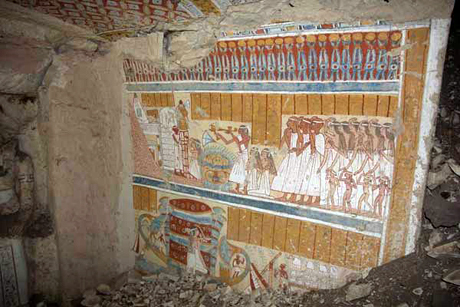 Spectacular archaeological year in Egypt. 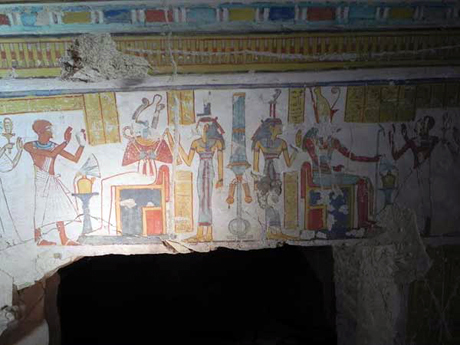 Astonishing that the tombs or tomb components of the overseer Xnsw-m-HAb, King Sbk-Htp, King Wsr-jb-Ra Snb-KAy, a coffin from the 2nd Intermediate Period, and the Ptolemaic remains recovered from an art theft could all be discovered in this short time. The heart of Ra is indeed strong! Unfortunately, news coverage of Egypt in the USA has focused mainly on negative political events there. It is important for outsiders to know that other aspects of life are still present. sorry but Khons/Chons was the name of an egyptian god, the son of Amun and Mut in thebes. 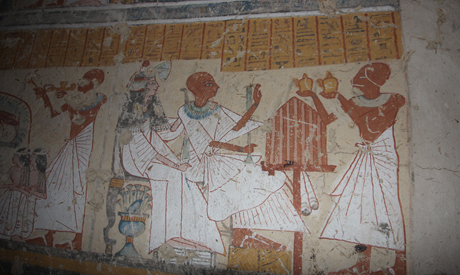 The egyptian Name Chons-m-heb means "Chonsu is in festival""
The actual photo of the ritual scene is second from top to bottom, titeled: "Colored inscriptions inside...."
" Scenes of the “Open Mouse” ritual also ....."
Now THAT is a person who is in Hell right now! What if you don't meet him there????? 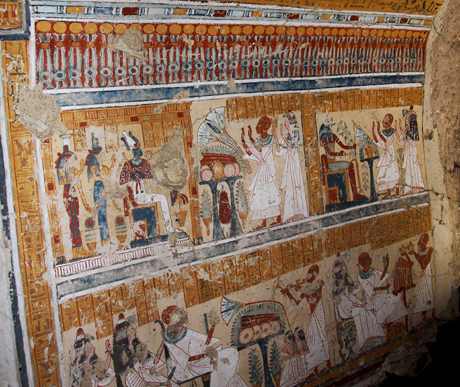 'It is also connected to an unfinished tomb of an as-yet unidentified person called Houn.' Isn't a person at least partially identified by the discovery of their name? Oh la la, the salafists and other ones will for sure be not that amused........the chief of beer production - for a GODDESS....... Congratulation, seem to be wonderful paintings in there! Great!